Oilmar.com is a B2B marketplace for Oil & Gas professionals. Oilmar's mission is to make eCommerce simple for the Oil & Gas industry. We offer easy to use tools for buying and selling assets, from start to finish. Including sales tax certificate management and secure settlement via escrow. 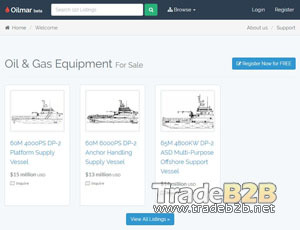 About Oilmar.com - Oil and Gas Equipment b2b marketplace's recommend,only on behalf of the views and opinions about B2B Directory, if you have any suggestions , please feel free to contact with us, we will amend and correct them in the first time according your suggestions. More better B2B Websites recomend, Please click here.